The club meets every Tuesday afternoon at 1 p.m. in the warm-up area at Falkirk Stadium and provides a centre where the registered blind or visually impaired can have an afternoon of fellowship and entertainent. Last week the excellent entertainment was provided by Mary-Rose and James, a duo who are no strangers to the club and always leave members in a happy frame of mind. Mary-Rose sang songs they can relate to and James played Shadows and Chett Atkins music on his guitar. The club is already looking forward to their next visit. We also thank them for their kind gesture in donating to the club’s Christmas Lunch which will be held on Tuesday, December 16 in the Cladhan Hotel. New members will always be made most welcome. 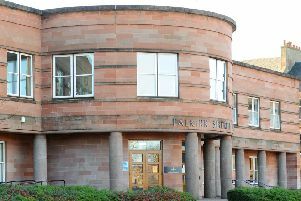 The Falkirk Solitaire Friendship Club offers over-60s dancing to live music in the Park Hotel every Sunday night from 8-11 p.m. For more information about our club, call Isabelle on 07846963901 or Marion on 07976975887. They will be happy to hear from you. The chairman introduced Ronnie Fitzcharles, manager of the Grangemouth coach company started by his grandfather in 1929. Initially it sold bicycles, then ran a taxi service and tried electrical contracting before settling on coach hire as the main activity. Ronnie wanted to join the business when he left school but his father asked him to first obtain qualifications. He tried mechanical engineering, but didn’t like the course, and changed to quantity surveying which was his job for a period. But the pull of coaches and the family business was still there and he joined the firm. He happily drove the coaches for many years, taking passengers on holiday to many places in Europe. The business intent has always been to give its customers a memorable trip, to stay in high quality accommodation, and make the journeys as comfortable as possible. Ronnie entertained the club members with a fund of stories on the events and incidents that face a coach driver when travelling through Europe. The ability to work hard, be resourceful and optimistic were requirements, but Ronnie’s infectious sense of humour were obviously a great benefit also. David Mould thanked Ronnie for entertaining the members with his amusing tales and giving an insight into one area of service to the local community. The next speaker will be Jane Grant, chief executive of NHS Forth Valley. Do you suffer from anxiety or depression? This is a group who meet in a friendly, supportive and confidential environment. There is a ladies group every Wednesday and Friday from 1-3 p.m. in Camelon Community Project, Abercrombie Street. There is also a men-only group every first and third Thursday from 2-4 p.m. in the Dawson Centre, David’s Loan, Bainsford, as well as a mixed group every Monday from 7-9 p.m., also in the Dawson Centre. For further information visit www.dashonline.org.uk or contact 07985461187. The fortnightly meeting of Falkirk and District Philatelic Society took place in Camelon Parish Church Hall on November 13. President Ian Anderson welcomed the members and after going over the business in hand introduced Derek Wiltshire from the Lanarkshire Philatelic Society who chose ‘The Belgian Congo’ postal history and stamps as the subject of his display. Initially, he spoke of the dreadful trading in slaves taken from that country which commenced in the 14th century and lasted until 1807. His display showed some of the very old issues together with some postal history (old envelopes/letters from way back) up to recent times. These later stamps depicted the change of routes and delivery times over the years. The president called on Alan Watson to give a very comprehensive vote of thanks to Derek and members responded with a round of applause. The next meeting is on November 27 at 7.30 p.m. at the same venue. New members are always welcome. Following the sell out support for their recent production of ‘Hairspray’ the Bohemians would appreciate your support for their Winter Brunch fund raising venture this Saturday in Falkirk’s Trinity Church Hall. The event runs between 10 a.m. and 3 p.m. and offers freshly made soup, tea, coffee, sandwiches, home baking, crafts and tombola stall. Tonight (Thursday) the Craft Group meet at 7 p.m. Tomorrow (Friday) the Parent and Toddlers Group meet at 10 a.m. Sunday services begin at 10 a.m. with Communion followed at 11 a.m. by fellowship and refreshments. The All Age service is at 11.25 a.m. with guest speaker Willie McLean from East Kilbride. The church prayer meeting is at 6 p.m. and at 6.30 p.m. is the Bible Teaching Hour with John Buchanan speaking on ‘Jesus Christ, the Alpha and Omega’. The Ladies Hour at Leishman Tower is on Monday at 2.15 p.m. when Helen Gordon will lead a Bible Study. On Tuesday evening at 7.30 p.m. is the Church AGM with reports on all the regular weekly activities. The ‘Young at Heart’ is on Wednesday at 2 p.m. with guest speaker Ernie Bayton of Kirkintilloch. By special request the Men’s Night on November 28 will involve the ladies for the first time with the interesting programme prepared by the men. Following last week’s well-received concert in Denny Parish Church on behalf of the local Home Start charity we continue serious rehearsals for ‘A Bairn’s Christmas’ concert. Scheduled for Sunday, December 21, the two performances, afternoon and evening, will cover many ‘weel-kent’ Christmas favourites which the audience can join in, while the combined Caledonia Choir and Festival Chorus provide the harmonies and descants. Falkirk Tryst Orchestra will also be there providing strong musical support – all guided by local conductor Bob Tait. Favourites such as ‘White Christmas’ and ‘O Come All Ye Faithfull’ will share the programme along with the lesser-know but beautiful ‘So Many Stars’ and ‘Christ’s Lullaby’. Tickets can be obtained from the Steeple Box Office - £12 for adults, £10 concessions and £4 for children. Ticket prices will include a free programme which will carry the words of the carols we will be invited to sing. Tickets are going fast, especially for the afternoon performance. Today (Thursday) the New Baby Group runs as usual from 1.15 - 2.45 p.m. in the Lower Hall and is open to mums and babies aged between birth and 12 months. This group is well established in St Andrew’s West, having begun in 1998, but also running at the same time in the Upper Hall is a new Mother & Toddler Group which has recently started. This is for mums with toddlers aged 1 to 3 years and provides an excellent opportunity for the youngsters to build friendships and develop new skills in a fun, play environment. Both groups enable mums to meet and share together over a cup of tea or coffee in a relaxed, friendly atmosphere. We invite you to come along and assure you a warm welcome. For older children, the Youth Club runs on Friday evenings from 7.30 - 9 p.m. for those between P7 and S4. A wide range of games and activities is on offer each week and it’s a great way to make new friends. Sunday worship will take place at the usual times of 11 a.m. and 7 p.m. with the Creche, Sunday School and Bible Class meeting during the morning service. We invite you to join us in worship. At the November meeting President Margaret Kean welcomed the members and our guests, District Chairman Pam Hull of the Corstorphine Club, President of Falkirk Rotary Club Robert Speirs and Lachlan McGowan a representative of the Maggie’s Centre Forth Valley. The 55th birthday cake was cut by President Margaret and District Chairman Pam before lunch was served and enjoyed by all. Anne Green lit the friendship candle and Pam addressed the members in her usual thoughtful way with as always a touch of Irish humour. She congratulated the club on reaching 55 years and presented us with an Emerald Certificate. Rotary President Robert Speirs brought greetings from his members and spoke of the continuing strong links between our clubs. Lachlan McGowan accepted a cheque on behalf of the Maggie’s Centre Forth Valley. The money was raised at the Charities Day on September 6 at our Maggie’s Kitchen stall. Lachlan also gave us an update on the progress at the site in Larbert which it is hoped will be up and running by late 2015. Anne Watson read the poem ‘Awakening’ by John McLeod which she read at the Association Conference when she was the ‘Scottish’ voice at the All Faith service. A certificate of 40 years membership was presented to Past President Anne Green. The Secretary reported that several members were in attendance at the Cenotaph on Remembrance Sunday and President Margaret had laid a wreath on our behalf. Shoe boxes and goods have been sent to Blythewood Care and a food and toiletries collection is on-going for the food bank. Several members were due to attend the District meeting in Edinburgh last Saturday and our next meeting is on Thursday, December 11 in the Park Hotel at 2.30 p.m. when we will meet for lunch at 12.30 pm. If you wish to have lunch please inform Loretta Waddell. There will be a Coffee Morning at Sandra Gillespie’s on Tuesday, December 2 at 10.30 a.m. The meeting closed with an omnibus vote of thanks from Elspit Sutherland. Pre-school nursery (enrolling now), Monday, Wednesday, Thursday, Friday 9 a.m. - 12.10 p.m.; Tuesday, 12.15 - 3.25 p.m. 2s Group, Tuesday, 9 - 11 a.m.; Thursday, 12.30 - 2.30 p.m. Toddlers, Monday, 1.30 - 2.45 p.m. Contact Lochgreen Playgroup, 24a Slamannan Road, on (01324) 629676 for more information. There is a demonstration by professional artist Bobby Rennie entitled ‘Contemporary Abstraction in Acrylic’ on Monday. New members always welcome, simply turn up at St Francis Xavier Church Hall at 7.15 p.m., doors open at 7 p.m. Contact the secretary for more info on 07730134422. Find us on Facebook under ‘Falkirk and District Art Club’. The next meeting of Falkirk Floral Art Club will be held on Monday, November 24 in the Lesser Town Hall, Falkirk at 7.15 p.m. for 7.30 p.m. The demonstrator is Sandra Halkett and her title is ‘Christmas Already’. Visitors welcome. The next meeting of NHS Retirement Fellowship will be held in Camelon Parish Church Hall on Wednesday, November 26 at 2 p.m. Step Forth has a programme of short weekly volunteer led walks across Falkirk. All walks are listed in this section of the Falkirk Herald. We also have walks at the beautiful Kinneil Estate in Bo’ness every Monday and Thursday at 10.30 a.m. and Tuesday at 2 p.m. All leave from Kinneil Museum. All Step Forth walks are free. For details call (01324) 504568/504556 or email stepforth@falkirkcommunitytrust.org. A walk leaves Falkirk Football Stadium every Monday at 7 p.m., led by volunteers. You will need a reasonable level of fitness for this walk as it can take up to two hours to explore the paths. Please wear suitable footwear. All walks are free. Next week the walks are Tuesday, November 25, 6.30 p.m. at Falkirk Stadium and Wednesday, November 26 at New Carron Co-op. Monday walk will leave from Falkirk Stadium as usual at 10 a.m. Please check our Facebook page for Thursday fast walk. Braveheart’s final monthly walk of 2014 is on our doorsteps. Come and join us on a lovely circular walk (4 miles) along the river Carron on Tuesday, November 25. Meeting place is the Carron Co-op, Ronades Rd, starting our walk at 1.30 p.m. and finishing around 3 p.m. were we can all head to the cafe for a cuppa and a chat! Looking forward to seeing you all there. No need to book, just turn up! Braveheart’s beautiful walk around Callendar Park every Monday, leaving from Callendar House at 2 p.m. will bring you back each week! You have the option of a slow 30 minute walk or a one hour walk of more brisk pace. Come along and meet our walk leaders, and friendly walkers where you can enjoy tea and a scone in Callendar House after your walk. For more information on our Callendar walk please contact (01324) 673703. At last week’s presentation of prizes for the 2014 annual High School creative writing competition for 1500 word short stories from St Mungo’s High School senior pupils, the following were the winners: 1. The Agnes Ford Trophy and £50, Magdalene Cybulska for ‘Breakfast’ (S6); 2. £25 Paul Boyle for ‘Doctor Doctor’ (S5); 3. £15, Wallis Spence for ‘Witness’ (S5). Congratulations are extended to the winners and thanks sincerely given to all competitors, without whom there would be no competition. Sincere thanks also to Writers’ Circle members who co-ordinated and adjudicated, with special thanks to Mrs Fiona Matheson, niece of the late Mrs Agnes Ford for presentation of prizes. Members are reminded that current topic stories will be read on Tuesday, November 25 and Tappit Heid submissions are due on December 2. Short stories with a Christmas theme are also invited on December 2. The service this Sunday, November 23 which commences at 11 a.m. will be led by Kay Brown and will be based on the theme of Persistence. Tea, coffee and fellowhsip will be available in the main hall following the service. Following the service this Sunday, come and visit Helen’s fundraising jewellery sale in the main hall. This is your chance to pick up some Christmas gifts from her beautifully made jewellery. The 4th Falkirk Girls’ Brigade are having their Christmas Fayre on Thursday, November 27 at 6 p.m. in the Ettrick Dochart Community Hall in Hallglen. The Bohemians Brunch will be held on Saturday, November 22 in the main hall from 10 a.m. All are welcome. CVS Charity Fair is being held here on Saturday, November 29 and our Saturday Cafe will be open on the day.